Monarchs love Scarlet Milkweed (Tropical Milkweed)! The caterpillars have nearly stripped my scarlet milkweed plants of their leaves. Should I cut the plants back now or just leave them as they are. They are about 4 feet tall. You can you go ahead and cut back the scarlet milkweed plants which will result in a bushier, shorter plant with more leaves . This encourages the new leaves to sprout and eventually these plants will feed more monarch caterpillars! I have some Tropical and Swamp Milkweed plants that are about 4" tall. I started them from seeds this past winter. They each have 8-10 leaves on them. When do I start pinching off the new leaves to force the plant to produce more leaves? You could probably start any time with maybe the top two. I am not very good about pinching off the leaves (can't bring myself to do it for some reason). But I realize you will get more leaves and branching that way. Let me know how it goes. Maybe you could take a picture of what the pinched plants look like after they get bigger?? I planted 3 swamp milkweed plants last fall. As of today, April 17 it looks like one is sprouting but the other look doubtful. Is this plant a late emerger in spring? Yes, it is usually late to emerge in the spring. Hopefully you planted it early enough in the fall so it had time for its roots to get established. Here is more detailed information on the perennial swamp milkweed. Good luck! I hadn't realized that the Asclepias curassavica is called tropical milkweed! I grow that here not far from San Diego. I have another Milkweed here that sometimes will live through the winter--we have no frost in a good part of my yard. I was given plants in return for giving a talk on herbs at a weekend event, and this was one of them. It's called "Family Jewels Tree" or A. physocarpa. I don't have any pictures handy, but the Annie's Annuals web page should still have a picture of it. It gets 6-7 feet tall, and has white flowers. I've had caterpillars make a chrysalis on them. It will hold lots of caterpillars. I'm wondering if the monarch larva can also eat leaves of other plants. I have no milkweed but have butterfly plants and in fact have found larvae on them. I recently found one viable larva and put it in a jar, with a branch and some of the plant's leaves, with the intention of getting some milkweed leaves. I also added 1 or 2 leaves of purple cone flower and beard tongue. Your thoughts? Monarchs only eat milkweed. What are your "butterfly plants"? Are they butterfly weed? Here is some more information on these butterfly garden plants. 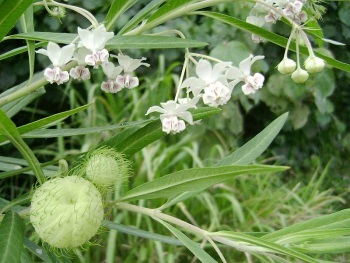 There are many other different types of milkweed. Check out this information on milkweed plants. I am not familiar with any butterflies that eat purple cone flower leaves or bearded tongue. John, asclepias tuberosa is definitely milkweed :) Enjoy! My 3 milkweeds have Monarch eggs on them & I've noticed the past couple days the leaves are turning yellow & falling off. Not sure what caused it, I gave some fertilizer because they seemed wilting. Now, I'm concerned there may not be enough for the eggs to eat & develop as needed to become butterflies. Any ideas what's going on with plants & what to do if anything? I have had the same thing happen with the milkweed especially in late summer/fall (maybe temperature or moisture related??). Hopefully at least some of the eggs will hatch soon then you can tear a small piece of leaf that the new caterpillar is on and place it on a healthy leaf. I know of no way to move a caterpillar egg. Anyone else have an idea? I bought a plant about 9 days ago. I bought it because it said that it attracted hummingbirds and butterflies. Within about 3 days there were monarch caterpillars all over it. Not 1 or 2...I counted sixteen. They've been growing, they devoured my plant and I went for another. They were so happy when I moved them to more food. Now...they keep wandering. I have the plant in it's original container sitting in a cat box. This had not been my intention, but I'm taking care of them as best as I can. Does anyone have any better suggestions? I only have a balcony and I don't want them wandering too far. ...help! How many Milkweed plants do I need? I live in S. Florida & I'm getting ready to plant a butterfly garden. The area is about 10' X 3' I bought 5 Milkweed plants about 2 1/2 ft. tall, 4 Lantanas, 4 Pentas. I'm thinking of trying to raise some Monarch indoors but is that enough Milkweed? Everything I'm reading says they eat tons of Milkweed leaves. Thanks for your help! 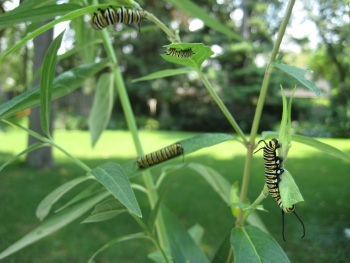 Yes, the caterpillars eat a lot of milkweed leaves. It sounds like your milkweed plants are fairly large so I would guess they have quite a few leaves. You could supplement your plants by growing tropical milkweed which is very easy to grow from seed and I would guess grows year round where you live. It also regrows after the caterpillar eats all of the leaves. I hope this helps.